While there are almost 1000 questions in the Greek New Testament, many commentators, pastors, and students skip over the questions for more ‘theological’ verses or worse they convert questions into statements to mine them for what they are saying theologically. However, this is not the way questions in the Greek New Testament work, and it overlooks the rhetorical importance of questions and how they were used in the ancient world. Questions and Rhetoric in the Greek New Testament is a helpful and thorough examination of questions in the Greek New Testament, seen from the standpoint of grammatical, semantic, and linguistic analysis, with special emphasis on their rhetorical effects. It includes charts, tools, and lists that explain and categorize the almost 1000 questions in the Greek New Testament. Thus, the user is able to go to the section in the book dealing with the type of question they are studying and find the exegetical parameters needed to understand that question. This is an exceptional book. It addresses an issue that most of us do not spend much time considering, namely, the questions of the New Testament. But questions give shape to the rhetoric of the text in ways we fail to appreciate, not to mention the fact that fifteen percent of the New Testament involves questions of various kinds. Estes writes with linguistic and academic savvy while remaining very clear, offering helpful examples and illustrations. If you have never questioned New Testament questions --- or even if you have --- this book will prove enormously useful. I’m delighted to see Douglas Estes deploy his considerable scholarly gifts and expertise in Greek rhetoric in this comprehensive yet accessible volume. This is a treasure trove for students and scholars alike. But I’m especially excited for pastors and Bible teachers to have this resource at their fingertips in sermon and teaching preparation. A wonderful resource. Douglas Estes has written a very useful book. Not only will readers now see old questions in a new light, but they will also be prompted to ask new questions for the first time. The technical language and theoretical categories that drive the book are shown to have clear payoff in understanding the text of the New Testament in a new light. Especially interesting here are the case studies that conclude each section, where Estes shows us with great care and precision just how much is being asked by the different types of questions in the New Testament. 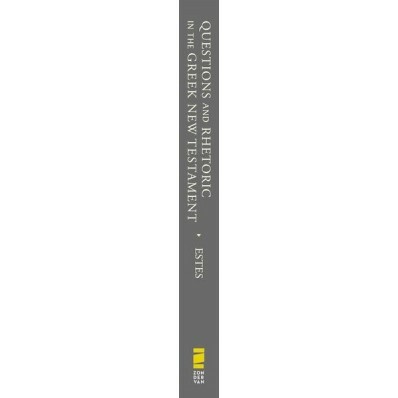 Recognizing that questions are both central to ancient rhetoric and often overlooked in contemporary exegesis, Estes offers an expansive interdisciplinary treatment of questions in the Greek New Testament against the backdrop of grammatical theory, linguistics, and historiography, among other disciplines. He develops — in much greater detail — his previous research on the questions of Jesus in the Gospel of John, and in the process provides students, scholars, and pastors with an incredibly useful tool for exegetical research. 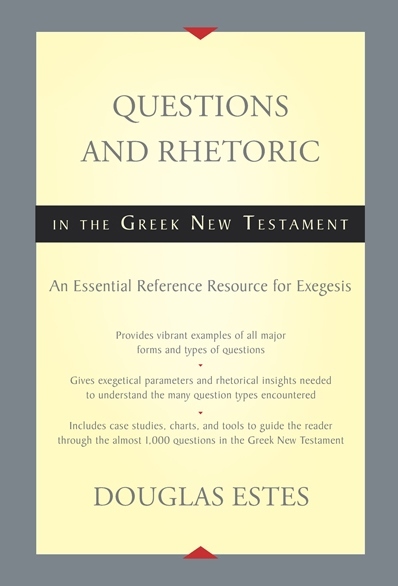 Writing with the precision of an expert, the nuance of a skilled teacher, and the sensitivity of an exegete, Estes introduces the reader to the twenty-eight linguistic features of question asking, the four major formations of questions, and the thirty-six question types found within the NT. This impressive book represents an important achievement in the study of NT Greek and deserves to be among the required texts for advanced courses in Biblical Greek grammar. I cannot recommend this book highly enough! Too often insufficient attention is paid to the logic of questions in the New Testament with the result that both exegesis and theological reflection are impoverished. Douglas Estes, in this interdisciplinary study, provides an excellent, user-friendly resource for analysing and understanding questions in the New Testament. I am sure it will prove to be an important exegetical aid for those engaged in a serious study of the New Testament, be they students, ministers, teachers, or established scholars. Just as questions bear significant rhetorical import within our conventional discourses, they play crucial roles within written texts. While Christian preachers and teachers may have learned well how to do exegesis of declarative statements, the rhetorical and semantic implications of questions have often eluded them, with detriment to their teaching and preaching. A conspicuous vacancy in exegetical studies is filled with Questions and Rhetoric in the Greek New Testament, a thorough, even if not exhaustive, exegetical guide concerning the rhetoric and semantics of questions in the Greek New Testament. Questions are powerful rhetorical devices, but surprisingly they have not been the subject of rigorous scholarly examination — until now. 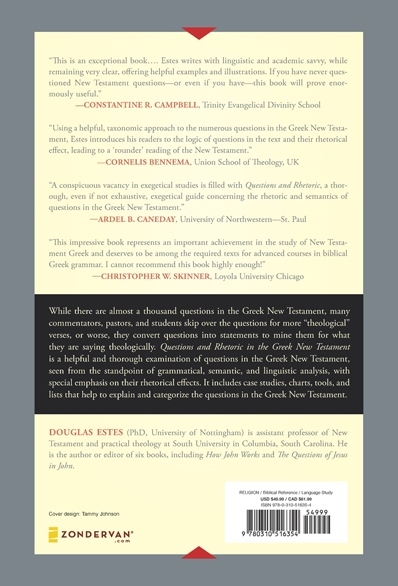 Estes, who has already established himself as an authority on the subject of questions in the Gospel of John (Brill, 2012), now extends his unique insights to the entire New Testament. Using a helpful taxonomic approach to the numerous questions in the Greek New Testament, Estes introduces his readers to the logic of questions in the text and their rhetorical effect, leading to a “rounder” reading of the New Testament. Douglas Estes has done students of the Greek New Testament a great service by writing a remarkably accessible introduction to a potentially arcane sub-discipline.